H&R partners with Volkswagen for 2018 Enthusiast Fleet | H&R Special Springs, LP. The season is upon us – the season of car shows and enthusiast events. Each year, Volkswagen of America, Inc. debuts a lineup of fun show vehicles, which exhibit the diverse design tastes of Volkswagen enthusiasts. 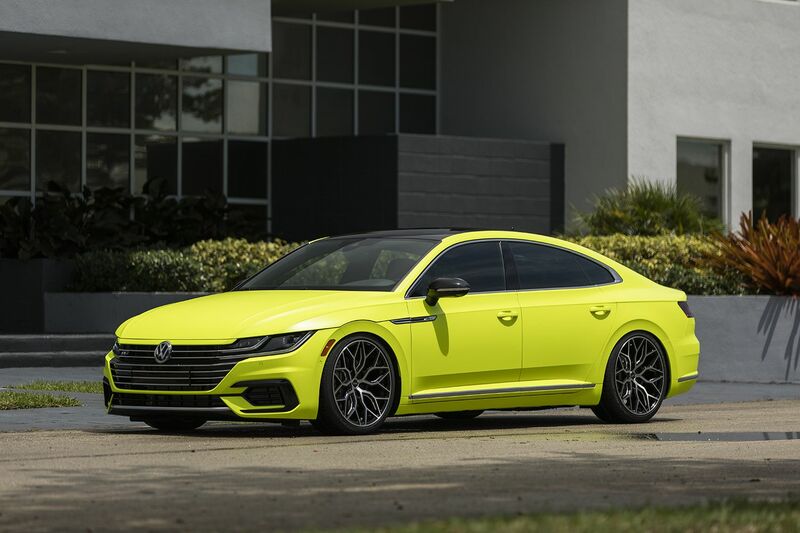 H&R has teamed with VW on two models – the 2018 Golf R and the all-new Arteon R-Line – to be debuted at the unofficial season opener, SOWO: The European Experience. In classic, European style, H&R Sport Springs were installed on the Golf R Abstract concept. These springs provide a subtle lowering of 1.0” front and rear for the perfect stance. With H&R Sport Springs, improved handling, gas mileage, and comfort are a few more perks. Landing later this year in the USA, is the Arteon. This all-new model from Volkswagen looks like art on wheels. The silky lines of the coupe-like four-door sit almost 3.0” lower thanks to a prototype H&R Ultra Low Coil Over kit. This is the ideal kit for ease of roof waxing. All of H&R’s products are 100% made in Germany and use only the finest quality materials and precision manufacturing to maximize service life, for miles of smiles.